"When spoken to yesterday, Mr Baird said the original Environment Southland report about the lagoon was not alarmist, but when peer reviewed that view changed and frightened the regional council into action. He believed this happened because some of the scientists involved were looking for more work, so he was not certain the science was completely accurate." It seems Mr Baird wants it both ways, he initially claimed the science was flawed because it lacked robust peer reviews and then he has suggested a conspiracy theory around scientists jointly fabricating the evidence to ensure further employment. In talking to local people who have regular contact with our waterways through their recreational activities there is a real awareness that things are not well with our water. Whitebaiters and fishermen are noticing an obvious reduction in catches and from their own perception the clarity and cleanliness of the rivers is in decline. The science supports what they have noticed themselves. Federated Farmers are using a global approach, common with many major industries, to discredit and devalue science and scientists who restrict their business interests. They have been successful in shifting pubic opinion away from the huge scientific evidence for man made climate change and there is a danger that our local scientists will be dealt with in a similar fashion. Federated Farmers have a popular ally in our Prime Minister, John Key, who has already questioned the standing of respected scientist, Dr Mike Joy, and repeated the view that there is no need for concern because our river are still better than most in the world. Surely we should be raising the bar for environmental standards in this country to a level that is amongst the highest in the world rather than being satisfied with mediocrity. The way to truly make a difference in protecting our water is to have clear standards for quality and give water an actual monetary value, both are priorities in the Green Party's plan to clean up our rivers. You're right, Chris, their arguments do sound silly but they have also been supported by our Prime Minister who seems to be incredibly popular. In other areas where there has been similar problems of degradation they have limited cow per hectare ratios, this may be the only option left if things don't dramatically improve. The new head honcho at Fed Farmers seems like a good guy who is interested in encouraging environmentally sustainable farming, so perhaps as the overall boss he'll reign in the dairy boss. I do worry about the stock ratios though, only in the sense that it still doesn't solve the issue of proximity to waterways, merely the amount of hooves on grass. I would think that an important factor in water pollution by dairy cows would be proximity, as I would imagine effluent run off would decrease with distance. Do you know if this indeed the case? If so, shouldn't this restriction be implemented in addition to stock ratios per hectare? I agree with all your comments, Sarah, and would add that the type of soil and general climate should also be a consideration. 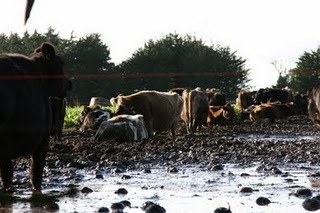 The land around the Waituna is largely peat and cannot really withstand high stocking ratios and the level of rainfall contributes a lot to the expected runoff. Southland did a topoclimate survey some years ago that collated soil and climate data in different areas to guide land use and this has been largely ignored with the expansion of dairying. Distance from waterways seems to make sense, if it weren't for the tile drains that lie under much of Southland's farmland. They make it much easier for 'watery muck' to move quickly across great distances and out into the water ways, passing right beneath and riparian plantings or berms. It's a major problem.